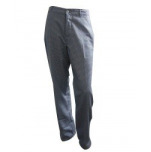 Houndstooth trousers special for cooking and cooks, 35% cotton and 65% polyester. Pants with fixed elastic in the back, button fly and pressures, 2 side pockets inserted at an angle, 1 applied back pocket and possibility of a belt. Sizes of 36 to 60.